My elephant took a wound in the second turn, stampeded through the unit that caused the wound, and into the first line of Romans. Unfortunately, Jumbo blew his dice against the Romans (the crew both caused wounds, though) and stampeded back towards home. I had already prepared for this possibility and had opened a lane for him. Some of my own skirmishers, and my army standard bearer, panicked at the site of the elephant fleeing, though. 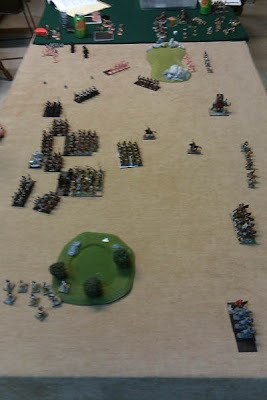 My heavy cav on my left flank (Gallic) have got themselves through the skirmishers and first line of Romans, and are locked in combat a little too far ahead of the rest of the army. Spanish caetrati have attempted to sneak through the woods in support. And this is towards the end of the game. On my right, I managed to let a big unit of Celtiberians get flanked. They took heavy casualties, broke and took most of the flank with them. A lone unit of Roman velites mopped up most of the fleeing troops. 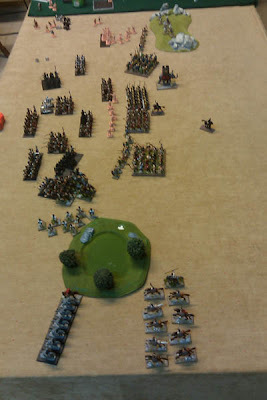 My left flank was a bit similar, the cavalry broke and panicked the nearby skirmishers and ceatrati. In the center I pressed forward as quickly as I could in a last ditch effort. But my Punic spearmen panicked from the antics on the flanks, and left just two units going in alone, a big mob of Celtiberians and a unit of scutarii. Both performed fairly well in combat, but not well enough to break through the Romans. In the long run, they would lose the battle of attrition, and were on the verge of being surrounded anyway. I mentioned elsewhere that I don't have much faith in elephants. I've never used on in one of my own armies, but I have faced them. From that point of view, I have rarely seen them perform well. So while I'd like to give him another shot (or two) I'm already tinkering with a Jumbo-less variant on the list.